Is social media causing bad self-esteem and self-worth issues? Is social media causing bad self-esteem and self-worth issues? Wait What Really OK Podcast Episode 63 hosted by Brand Precision Marketing Strategist and Counselor, Loren Weisman discusses a few simple tips and applications to apply to your speaking engagements. In a world where so many present an unrealistic version of themselves on social media, it's no wonder self-esteem has taken a dip. In this presentation that is not completely true, it can put pressure on many to try to live up ... Más informaciones to lies and these false claims that have either not been achieved yet or are very far off. This self-pressure to appear happy, successful, professional and experienced is hurting more than helping. it is causing many to find themselves lying more to cover up earlier lies and only hurting their reputations as they are found out to not be telling the truth. The best answer is to find, present and live in a true, humble and honest place. Yet, for many the lies and the pretend seem to be more comforting. Weird, right? 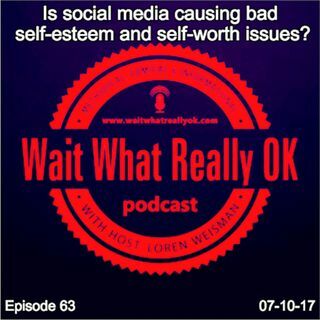 Ep 63 “Is social media causing bad self esteem and self worth issues?” of the Wait What Really OK Podcast is available on iHeartRadio. Podcast Blog Supplement for Episode 63 of the Wait What Really OK Podcast with Loren Weisman. Podcast Link Supplement for Episode 63 of the Wait What Really OK Podcast with Loren Weisman. Why should you like my video? Not because I asked you to, and I wont. Podcast Video Supplement for Episode 63 of the Wait What Really OK Podcast with Loren Weisman. Podcast Photo Supplement for Episode 63 of the Wait What Really OK Podcast with Loren Weisman.